February 2009, the University of Limpopo in Limpopo Province experienced student protests concerning accommodation, National Student Financial Aid schemes (NSFAS) support, quality of staff, alleged victimisation of students by some staff members, and academic exclusion. The protests had caused significant damage to property and threatened the safety of students and staff. Some Student Representative Council (SRC) members and students were arrested and faced disciplinary and criminal actions. September 2009, students at the University of the Witwatersrand (Wits) and the University of Pretoria in Gauteng Province staged a series of demonstrations. At Wits, students were opposing plans to increase fees, and at Pretoria the call was for political party representation in the Student Representative Council (SRC). At both universities the protests were peaceful and democratic. February 2010, at Mangosuthu University of Technology in Durban, KwaZulu Natal Province, students protested demanding good accommodation and lower tuition fees, as well as 16 buses, promised to transport students from residences to campus. 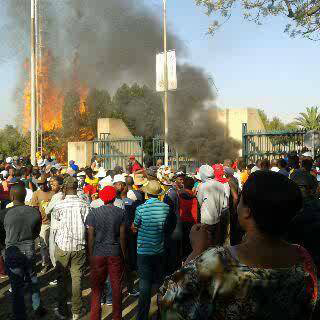 At Tshwane University of Technology in Pretoria student protested against slow registration and 'filthy' residences. March 2010, students at the University of Johannesburg's Bunting Road campus protested demanding free education. The protest was instigated by South African Student Congress SASCO members. October 2010, students at Stellenbosch University held a peaceful protest demanding affordable tuition fees and accommodation fees. The protest took place at the Tygerberg Campus. The action came after students learned that, starting in January 2011, their tuition would jump by 11 percent and their residential fees by 14 percent. February 2011, University of KwaZulu Natal (UKZN) and Durban University of Technology (DUT) students protested over fees and academic exclusions of students. In 2011, Cape Peninsula University of Technology (CPUT) protesting students disrupted tests and lectures and chased non-protesting students out of class. The protest involving hundreds of students who were pushing for Vice-Chancellor Mazwi Tanga’s resignation, claiming there was no improvement at the institution since she took office in 2009. Additionally, they wanted better, and more, computers and printers, library opening hours should be extended from 9.30pm to midnight, and they were against 15 percent increase in residence fees. January 2012, Cape Peninsula University of Technology (CPUT) students affiliated to the South African Students’ Congress (SASCO), gathered at the campus to protest against the R5 000 registration fee. The university expected students to pay an amount of R5 000 for residences.Students were prepared to pay R3 400 for residential students. August 2013, students at Walter Sisulu University of Technology in Butterworth, Eastern Cape Province, protested over the closure of the campus. Police fired rubber bullets to disperse protesting students. Student’s outrage had followed the university's announcement that the campus will close due to five weeks of labour strike. Political parties and student organisations condemned the decision to close the university indefinitely. September 2014, Tshwane University of Technology (TUT), Gauteng Province, students embarked on a violent protest over NSFAS funding deficits. Students wanted the university to ensure that R46 million in student loans was made available to assist a group of 2 500 unfunded students for the remainder of 2014. January 2015, a group of students protested at the University of the Witwatersrand (Wits) over problems with funding and registration. The students claimed they were promised money for the 2015 academic year through the National Student Financial Aid Scheme (NSFAS) but were now being forced to pay outstanding amounts from 2014. April 2015, University of Cape Town’s student protested for the removal of Cecil John Rhodes’ statue. During the protests students voiced their frustration over the slow transformation phase at the university. The protests sparked a debate on race relations, access and funding at the university. The statue was removed on 9 April 2015. May 2015, the Open Stellenbosch movement, a student movement at Stellenbosch University, in the Western Cape, marched to the Stellenbosch university's administration building to demand the vice rector apologise for controversial comments on the university's language policy. The students delivered a memorandum calling on the university to transform its language policy and promote inclusivity. May 2015, students protested at the Technical Vocational Education and Training (TVET) College in Richards Bay, KZN demanding financial assistance. They damaged campus property and set waste bins on fire. The police arrested 121 students.